The Twin Cities area, as I noted in my first entry in this “Gluttony in Los Angeles” series, has acceptable Sichuan food. The first major restaurant was Little Szechuan in St. Paul. This was followed by Grand Szechuan in Bloomington–opened by the erstwhile chef of Little Szechuan who apparently decamped with the entire kitchen. After this defection, Little Szechuan fell into decline for a while, and then recovered with a new chef who installed a number of new dishes on the menu. I believe he left too–or at least this is my explanation for the decline that followed again, and from which they have not yet recovered. Grand Szechuan, however, continues to be quite good (there are a number of newer places too, but we have not visited them). However, the range of dishes (and ingredients) available at Grand Szechuan (or Little Szechuan in its heyday) cannot begin to compare to what is available at relatively unassuming places in the San Gabriel Valley outside Los Angeles. This is largely an issue of demographics. The vast majority of Chinese restaurants in the SGV cater to Chinese diners, often from the very region of the restaurant’s specialty; meanwhile, encouraging though the proliferation of Sichuan restaurants in the Twin cities is, more than half of the diners at Grand Szechuan at any given time seem to be ordering from their menu of American Chinese dishes, which is not something even on offer at Sichuan restaurants in the SGV. When we lived in LA, and when we first left, our favourite was Chung King, which was then on Garfield in Monterey Park but then upped and left for San Gabriel (there was and may still be another restaurant with the same name that continued in the same location). Chung King, technically serves the cuisine of the Chongqing region which is no longer part of Sichuan but this is mostly a technicality. In recent years we’ve inexplicably shifted our loyalties to Yunkun Garden, which started out as a Yunnanese restaurant (and has gone through a number of name changes from Yunnan Garden to Yungui Garden to Yun Chuan Garden to Yunkun Garden) but, nonetheless, has an extensive menu of dishes from neighbouring Sichuan. Indeed, I’m not knowledgeable enough to know which dishes exactly are Yunnanese dishes (except the classic noodle soup the majority of people at the restaurant have on their table), and for the most part we get all the stuff we used to get at Chung King and can’t really detect a difference in approach to them. As at most Sichuan places in the SGV the ambience is unassuming, the attitude pleasant but hurried, and the heat level quite hot by default. You navigate an extensive menu of dishes whose descriptions have been more or less literally translated, and while you wait (not very long) for what you asked for to arrive you pick some dishes from the cold bar at the front. The quality of the description on the menu means that while you rarely receive a dish with things in it that you don’t expect, if you haven’t had it before, you might be surprised by the form/nature of the dish. And the cold bar is often point and hope for the best, as the woman staffing it at any given time may or may not have English better than your Mandarin. Still, it’s very hard to go wrong. Cold seasoned kelp. A must have, both for its own qualities and as a relief from the heat. Very good as always. 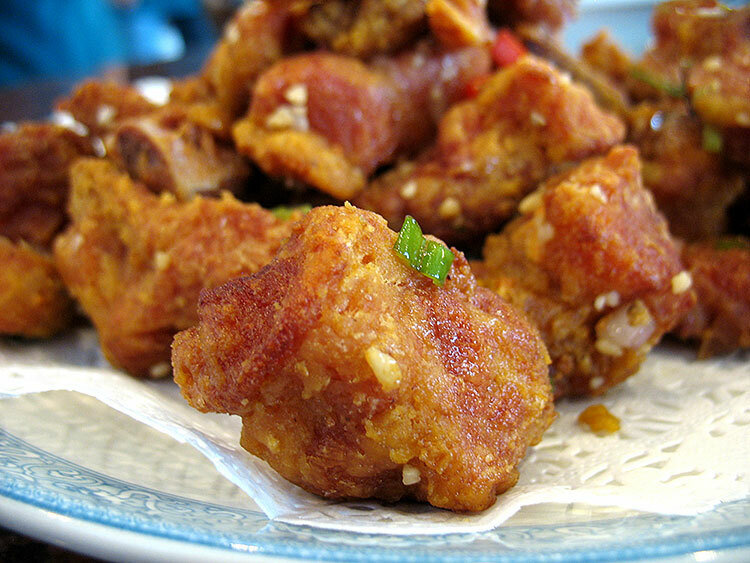 Chicken gizzards with a mildly spicy dressing. Quite good. Cold sliced chicken with spicy dressing. A steamed chicken is hacked up on the bone and drowned in chilli oil and a rich earthy sauce made with soybean paste and peanuts. I love this and always have to get it, here or at Chung King. Garlic spare ribs. This is the spouse’s must-have dish, and is always excellent as well. Ma Po Tofu. Thanks to Fuchsia Dunlop, I make a pretty good Ma Po Tofu–even the critical spouse prefers it to the versions available in the Twin Cities–but the versions in the SGV are in a different league. This did not disappoint. Three Flavour Fish. Not sure what the three flavours are but this is a very mild but complexly flavourful dish with fish, Chinese leeks, mushrooms and some squid in an earthen pot. Very, very good. A very, very good meal, and loads of leftovers to take home–all for $54 after tax and tip. Still, I think a return to Chung King is in order when I go back to Los Angeles in August to pick up the family. Only one more restaurant post to come from the recent trip, and then we’re back to mostly whisky reviews for another month. This entry was posted in *Food, Los Angeles and tagged Chinese Cuisine, Los Angeles, San Gabriel Valley, Sichuan, Yunkun Garden. Bookmark the permalink. Looks delicious! Will try it soon. Chung King in its new digs in SG is still quite good, but not quite as magical as my memories of the old location. Not sure why.